During my foundation quest, I have used Dior Airflash off and on for a couple of years. Despite the rather disturbing notion of spraying a foundation onto one's face (much like a can of paint), I was initially impressed by this product's seamless finish and demi-matte, skin-like texture that softens lines and lasts a respectable eight+ hours in a variety of weather conditions. Since this product has been on the market for years, I don't think my review on this formula will be novel; however, I hope to contribute to the conversation with regards to the new shade release (#201) and my favorite way of applying this! Retailing for $62, three potential caveats of this foundation are the steep price, complexity of application and how quickly one can run through a 2.3 ounce can of this perfecting elixir. I have found that with occasional usage (4-6 times a month) and appropriate application, a single can of this foundation can last nearly four months. After experimenting with a variety application processes (e.g., spraying it directly on the face, spraying it onto a sponge and then applying etc. 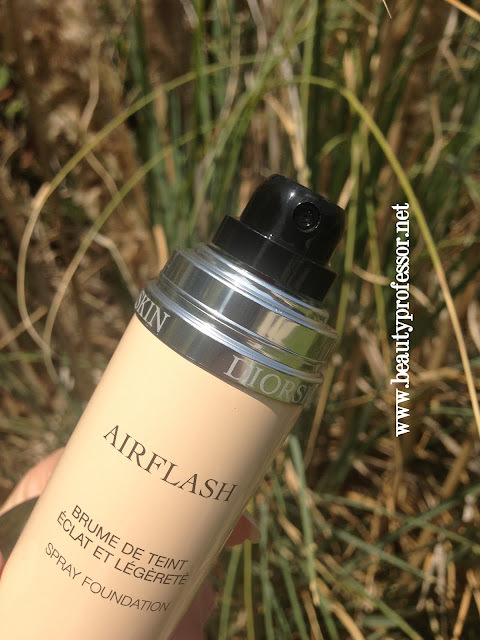 ), I have experienced the absolute best results when I spray it on a foundation brush (in my case, the Sephora Airbrush #56) and buff it into my face. Dior Airflash in #201 Linen is a fortuitous release...it is a fantastic yellow-based beige that should have been released years ago (when one takes into account the popularity of Dior's Linen shade in other foundation formulas). It is between NC 23 and NC 25 and doesn't oxidize once applied. For years, I wore #301 Sand (NC 27-30) because it was the only shade that had warm yellow undertones and a shade semi-close to my skin tone depth; sadly, however, Sand was often a bit too dark and had to be lightened with powders or primers. The arrival of #201 Linen has changed this plight and I know I am not the only one pleased with this addition! 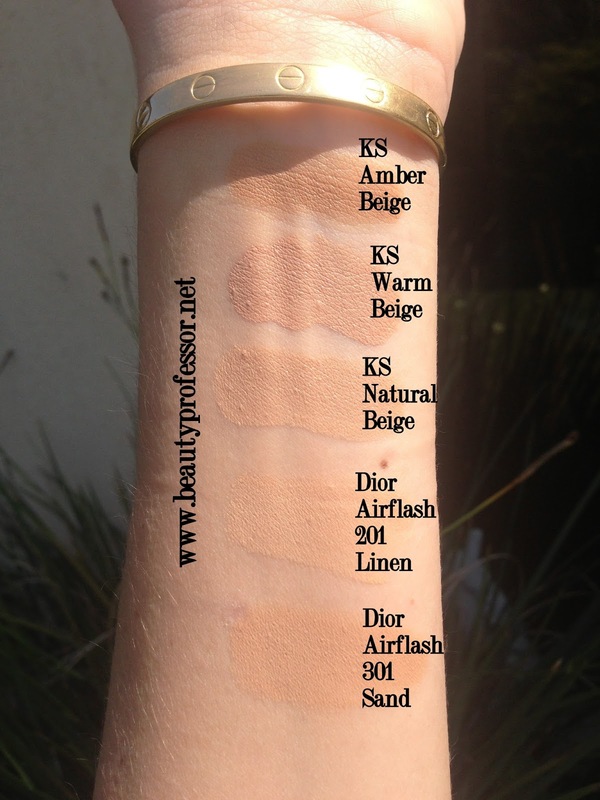 Texturally, this foundation is incredibly light while simultaneously providing excellent, buildable medium coverage. 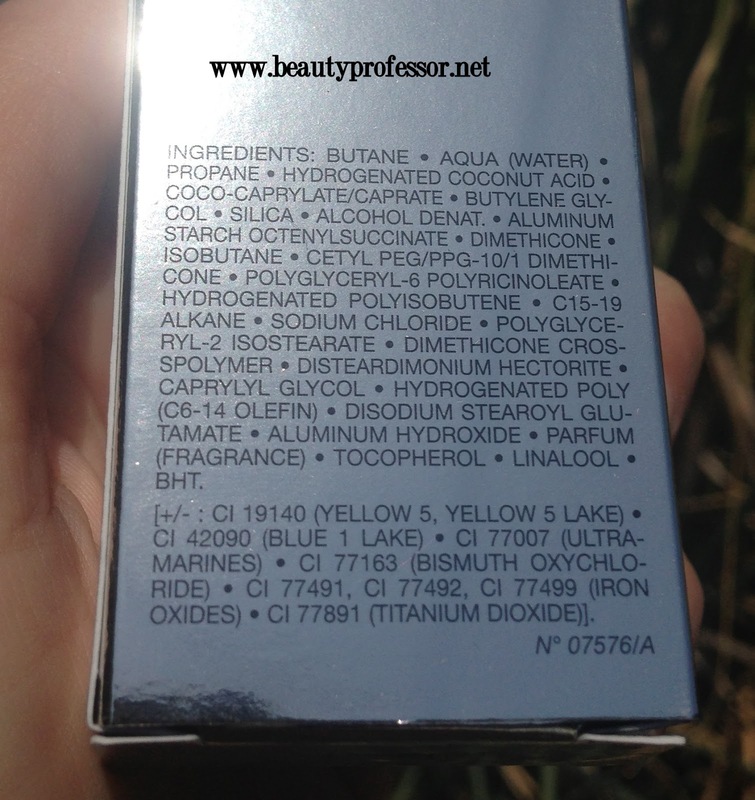 Although fragrance is included in the ingredients list, it is a challenge to detect it once applied. Even though it doesn't boast any skin care benefits, and, in contrast, contains some questionable chemicals, my skin thankfully hasn't encountered an ounce of irritation over years of intermittent usage. 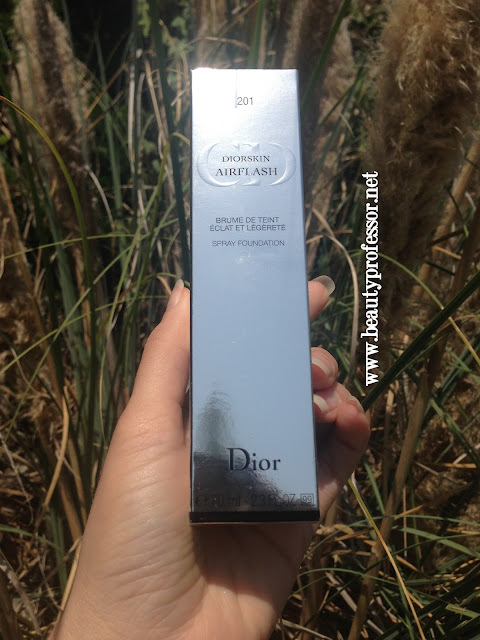 There is a reason that Dior Airflash has remained on the market for so many years without a major revamp or reformulation...this foundation's efficacy is undeniable! It works with a variety of skin types (e.g., dry, combination, oily, sensitive, young skin, aging skin etc.) and melds with the skin in a way that transcends that of traditional liquid foundations. 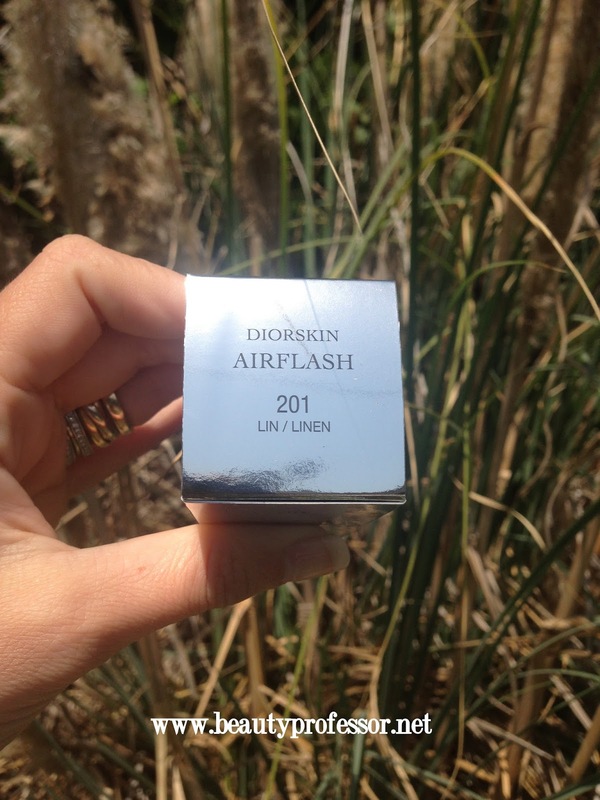 Above: This sleek silver box houses the Airflash, which comes in a 2.3 ounce aerosol canister. 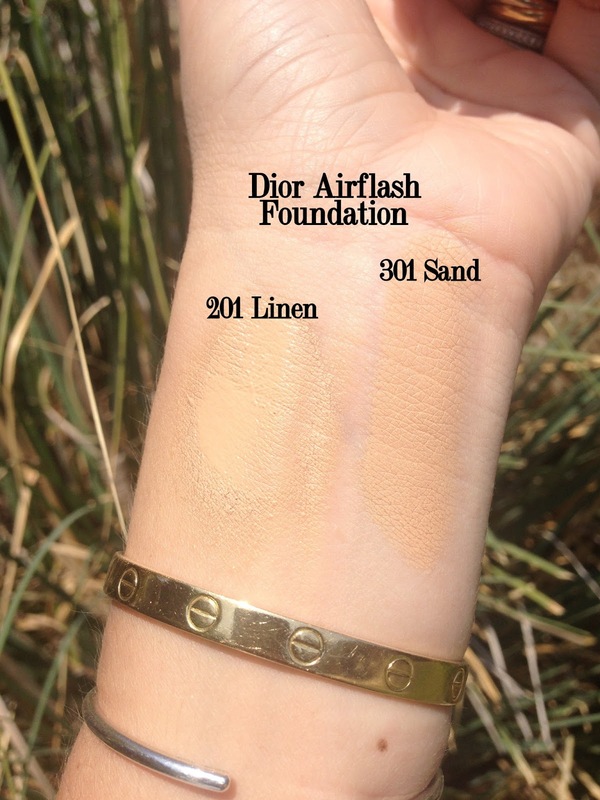 Above: Linen #201 is Dior's answer to NC 25...I cannot believe it took the company this long to release this in-demand shade! Above: The full ingredients list...anything facial product containing Butane is a bit daunting to say the least, but I haven't experienced any immediate or long term irritation from usage. Above: The spray nozzle resists buildup and is simple to operate, making this foundation safe for your bag! Above: Linen and Sand in direct sunlight...Linen is close to NC 25 and Sand is approximately NC 30. Above: I am currently NC 25 and my most flawless matches in the lineup above are Kanebo Sensai Natural Beige and Airflash 201 Linen. 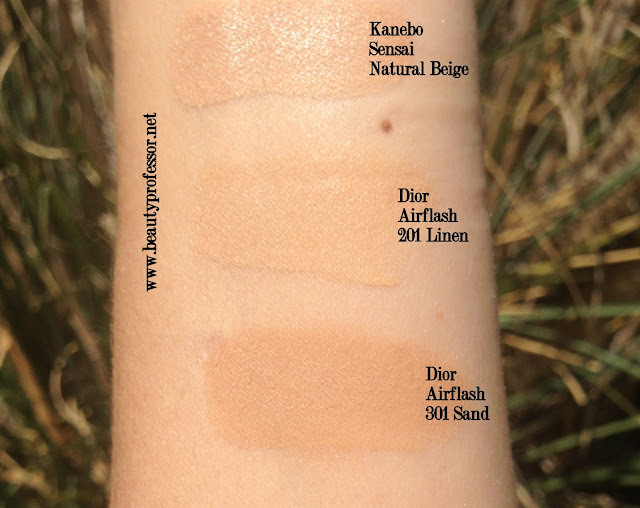 Above: Swatches (ranging from NC 25-NC 35) in outdoor shade. Above: If I get a bit more color (thereby pushing me over the edge to NC 30+), then Airflash Sand #301 will be a perfect match. Above: All five swatches in direct sunlight (at twilight!). Above: Airflash on my face in indoor lighting. Above: In outdoor indirect light. 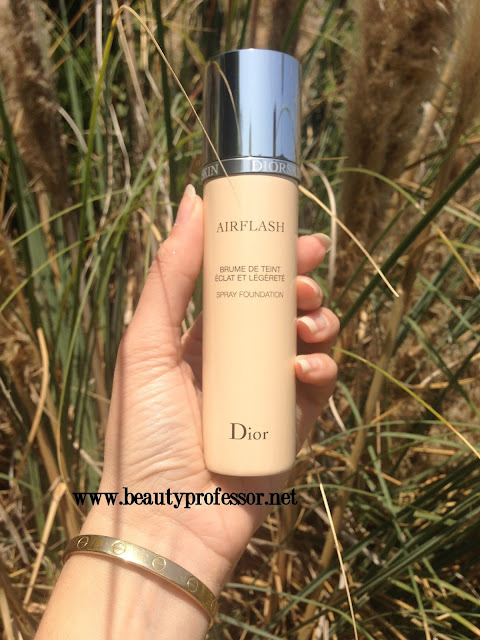 Bottom Line: Dior Airflash is a fascinating foundation incarnation. From the rather large aerosol can to the next-to-nothing mist expelled, this anomaly produces a lasting, lovely, medium-coverage skin finish with a few sprays and a round of buffing. Although some of the chemical ingredients are less than desirable, the overall effect makes this foundation a worthy candidate for intermittent usage. It has a thin texture that evens skin tone and blurs fine lines without settling or caking and once one masters the knack of application, this foundation becomes a viable choice for anyone seeking a bright, matte-yet-glowing, balanced complexion that lasts for hours. Highly recommended! Hi Amber...yes...if you are a foundation lover, this is a "must try" product! The lighter yellow-based beige makes this more accessible to those of us in that range...can't wait to hear your thoughts if you end up trying it! Thanks so much! I believe I mentioned the Le Metier de Beaute Peau Vierge #2...it is my first layer every day and I know I have both a review and swatches of this product on my blog (just type "Peau Vierge" into the Search bar!). Since you've given me such good information :o) I'll pass on some products I've discovered. I ADORE Sisley Phyto-Teint Eclat Fluid. It is very light and skin like and simply beautiful. I've only ever owned one bottle because it is so pricey but I covet it every time I go to BG. I feel like I just stepped out of a celebrity dermatologists office when I apply it because it is so radiant and perfecting. The only teensy complaint I have is that in very hot weather I get about 4 hours out of it. You may get better mileage if you powder but alas powder and I do not get along. Another product I really love is Amore Pacific tinted moisturizer. I use it as a moisturizer. :o) I love it. I keep it in my handbag and apply a little if I start to get dry in the afternoon. It has a lovely softness. I also LOVE LOVE LOVE By Terry Enhancer in Apricot. I always always get compliments whenever I wear it. The only negative to this is that the effects don't last super long (again 3 to 4 hours in any weather for me) but great if you are meeting someone for brunch or dinner and want to look glorious. I recommended it to my Mom who is 68 and it really lights up her face. Like you, I've tried countless foundations and these are the ones I love but didn't see that you've tried yourself. Thank you for the wonderful comment...I enjoyed reading it ; ) I am so glad you found your way to my blog! Wow...you bought three of my favorites this weekend. I hope you are loving them as much as I do. I love the Airflash, but find myself using the Kanebo more often, so I suggest just embracing that for awhile. You were fortunate to be able to pick it up so quickly...I have so many readers all over the country trying to track it down to no avail...this formula is a tad elusive! 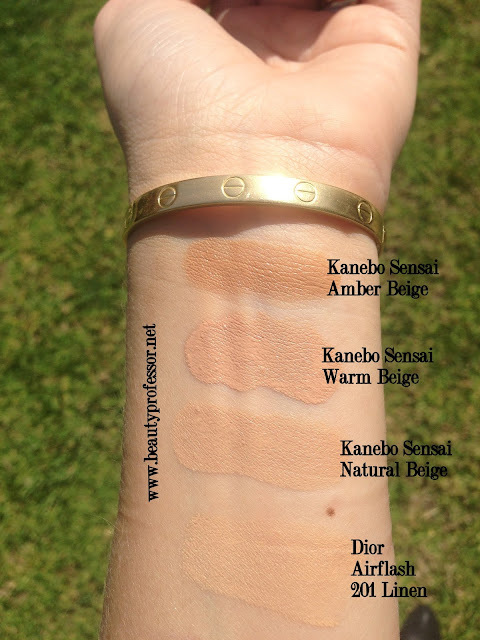 Thanks so much for sharing the products you currently love...I am always impressed by Sisley products but haven't been able to find a good match in their foundation for ages. I must go check out the By Terry Enhancer in Apricot next time I'm at Space NK...very intriguing! The By Terry Enhancer is really spectacular. People have literally stopped me on the street to compliment me and I don't have naturally beautiful skin by any means. I also just wanted to clarify for you and other readers that the performance I mention for both the Sisley and the By Terry are without a primer (or powder). I have not been able to find a primer that I can force myself to wear. They all seem very "uncomfortable" on my face. I hope the Peau Vierge will change that for me! Excellent! I have officially added Apricot to my "buy list!" I truly hope the Peau Vierge transforms your view of primers as well...it is definitely a non-negotiable step in my routine! Thank you, Anon! I hope you find your perfect match in this formula...don't hesitate to me know if you have any questions! A foundation I now need to try. This new shade looks perfect for me. Thanks for the review. Hi B.P, thank-you for the video. I really love the blogs but enjoy the videos so much as you show us tips we might not have tried. The Linen in Dior is a spot-on match like you said. I ordered something like the aeorosol. It's by Mally & was released this weekend on QVC. Yes it sounds funny but I get amazing deals on good makeup & kits that are exclusive to them. Anyway, Mally created this for 1 of her celebrity clients who detests the feeling of foundation but wanted something light & full-coverage. It's in a can that u also have to shake & is pretty pigmented. It comes with a great air-brush brush. The finish is supposed to be air-brushed, light & perfect for summer & long wearing. I will keep u posted when it arrives. I ordered medium instead of light & hope it works w/my summer skin. Still wanting the Kanebo so bad. The finish is beautiful! Take care. I also had a question: I am intrigued by the Nars light reflecting powder as it seems like your new favorite that u reach for again & again. Do u think I should go for the Hourglass in the bronzer color, I think called Radiant or the Nars? I love anything glowing & they both seem to do that without glitter. I was thinkin Nars might be better for winter but I don't think it translates as white or chalky. Radiant I thought might be a better choice as a setting and adding color option for summer. What do you think? Thanks as always. Hi Lynn...I really like the NARS Light Reflecting Powder because it adds an oxymoronic glowy matte finish without changing the color or texture of whatever foundation you happen to be wearing. The Hourglass powders are beautiful, but they all have some pigmentation (with Diffused Light being the absolutely lightest), so you might be interesting in using Radiant in the summer and NARS in the fall (however, I love the NARS right now in the dead of summer because it perfects so subtly!). I hope helps...xoxo and talk soon! Thank-you so much, think I'm gonna get the nars b/c your skin looks flawless w/it. Also, calling Kimmy now! Even though I mentioned I spoke to someone, I don't want to wait & take a chance & it doesnt arrive again. Been obsessed w/kanebo since the moment you posted it! Have a wonderful week. xoxo, have a lovely week and do keep me posted! I think this is going to be my new favorite foundation!